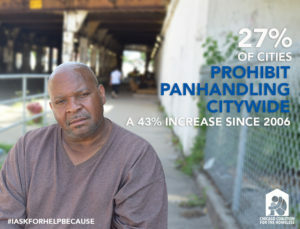 From Chicago to Carbondale, 15 municipalities across Illinois have panhandling ordinances that are unconstitutional and must be repealed, according to three prominent advocacy organizations. As part of a national effort, letters challenging 22 panhandling ordinances were delivered Tuesday by the Chicago Coalition for the Homeless, American Civil Liberties Union of Illinois, and National Law Center on Homelessness and Poverty. Letters were delivered to Aurora, Carbondale, Champaign, Chicago, Cicero, Danville, Decatur, East St. Louis, Elgin, Joliet, Moline, Oak Park, Peoria, Rockford and Urbana. “Panhandling laws are used to unfairly criminalize people experiencing homelessness for exercising their First Amendment rights. 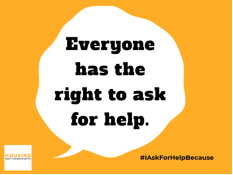 Every person has the right to ask for help,” said Diane O’Connell, community lawyer at the Chicago Coalition for the Homeless (CCH). In an effort coordinated by the National Law Center on Homelessness & Poverty, advocates across the U.S. Tuesday demanded more than 200 cities in 12 states repeal outdated panhandling ordinances. Since a 2015 U.S. Supreme Court ruling that requires closer examination to laws that regulate speech based on its content, (Reed v. Town of Gilbert), panhandling ordinances have been repealed or struck down by the courts in more than 55 cities. Many of the bans addressed today are long-standing ordinances that were not updated to address changes in Supreme Court jurisprudence. The letters cite creative approaches to reducing panhandling, like an effort in Philadelphia that established a day shelter in an unused transportation station in the city’s downtown. The ACLU and CCH argue that such approaches are more appropriate than barring individuals from panhandling.